I spent a good chunk of time in France recently, and while my work travel was dramatically higher in that time period, and therefore I wasn’t able to spend every single day exploring the country, I managed to make the most out of my time there. One of things I fell in love with while I was there was café gourmand. Café gourmand varies from restaurant to brasserie to bar in its availability and implementation, but the gist is an espresso served with small portions of desserts, sometimes called mignardises or petits fours. I feel like France has been keeping a secret from me this whole time. Not cool, France. The presentation of the café gourmand is beautiful, and that’s something the French really know about. Usually there are 3 or so desserts, with some café gourmand being accompanied by as many as 5-6 desserts. Often it’s served on a special plate made to hold the espresso cup plus all of the desserts. The desserts range in offering but you’ll sometimes see popular French desserts like the macaron (I have recipes for French macarons here, if you remember), crème brûlée, tarte au citron (lemon tart), or even ice cream or fresh fruit. Before I blame myself too much for not being observant all of these years, it appears café gourmand is a relatively new concept in France, too. Wikipedia says they think it started sometime in 2005 in Paris, but even that isn’t 100% sure. In any case, it’s not a centuries-old tradition, but it is delicious nonetheless. If only we could get Italian-quality espresso as the coffee (France is not known for their espresso…and some of it is quite bad), I’d be in heaven. When should you order café gourmand? I think the best time is probably after lunch, mid-afternoon, or even after dinner, if you can’t choose which full-size dessert to order. Add this to your to-do list for your next trip to France. Go ahead, I’ll wait. What do you think of café gourmand? Genius, or overkill? We capped off our Sicily trip this year with 9 days in Paris. I was pleased to see how my expresso and sweets cravings were rewarded. Your post makes me want to run out and hit the bakeries but it would not be quite the same. My two favorite food groups- coffee and pastries! 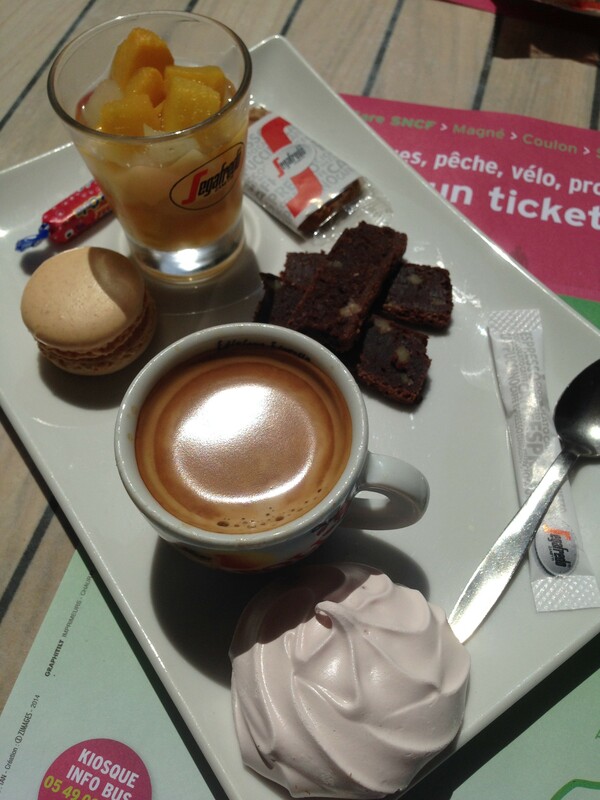 The sweets were definitely a wonderful treat in France, but the coffee was dreadful. Next time I will research a cafe which does both like this equally well! This combo is a surprise to me also.